Pest management has changed over the last few years. Not so long ago, the focus was on choosing the most potent insecticide for the pest you wanted rid of… even if it killed everything else as well. This was a simple approach based on immediate results. However, it’s become increasingly apparent that the beneficial species (predators and parasites of the pests) need to be given due consideration. If you want to maximise the impact of naturally occurring beneficial species, there are a couple of key decisions to make. First, select pesticides (insecticides in particular) that do not cause serious disruption to beneficial species. Beneficial species include predators and parasites. The predators simply walk up and eat their prey (pests) and the results are seen immediately. Parasites (usually wasps) live inside their hosts (White Butterfly Caterpillar, Diamond Back Moth etc.) for most of their life and so their impact is often underestimated. However, the impact of these two groups of beneficial insects can be massive, and when combined with the use of selective insecticides the overall results can be quite remarkable. Fortunately, there are insecticides on the market now that are highly effective on the pests, but are not disruptive to key beneficial species. But you need a two-pronged approach to get the most benefit out of beneficial insects in your brassica crop. So, your second key decision is how to promote and support the beneficial species. For example, if a wasp feeds only on water, then it will live for a few days, lay eggs in a host pest, and kill a few pests. However, if provided with a nectar source (such as from flowers like Phacelia) then the same individuals easily live for a couple of months or more, and their impact on pest populations is magnified massively. The latest in IPM management for forage brassica crop is to plant some Phacelia alongside brassica crops. The Phacelia needs to be flowering to attract and sustain beneficial insects, therefore it is best planted in a headland of the brassica crop at least a month before sowing. Phacelia usually takes between 6-8 weeks to flower after planting. Brassica herbicides are generally not compatible with Phacelia, so you’ll need to take care not to overlap the Phacelia strip with the spray boom. 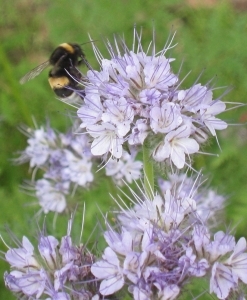 Phacelia seed is available from Luisetti Seeds. Increase your productivity for young stock COUNTRY DOWN TOWN!